The West Essex Trail, according to its web page on the Essex County site, started out as the Caldwell branch of the Erie-Lackawanna line. The county acquired the land in the 1980s and began turning it into recreational areas over the years. The trail starts in Verona and continues northeast through Cedar Grove to just over the border into Little Falls and Passaic County. Terrain-wise, it’s a nice easy hike, since it used to be a railroad. You could probably hike the whole thing end-to-end and back in the space of a few hours. It’s pretty popular with walkers and bikers; this being a summer weekend, I saw a lot of bikers – grownups and kids – a few joggers and a fair number of dog walkers. On this particular day, I only got up as far as the Peckman River bridge in Cedar Grove before I had to turn around, because I had other plans for the day. Most of the trail, except for a small section near the Little Falls border, coincides with the Lenape Trail, a walking trail that runs through a good section of Essex County. 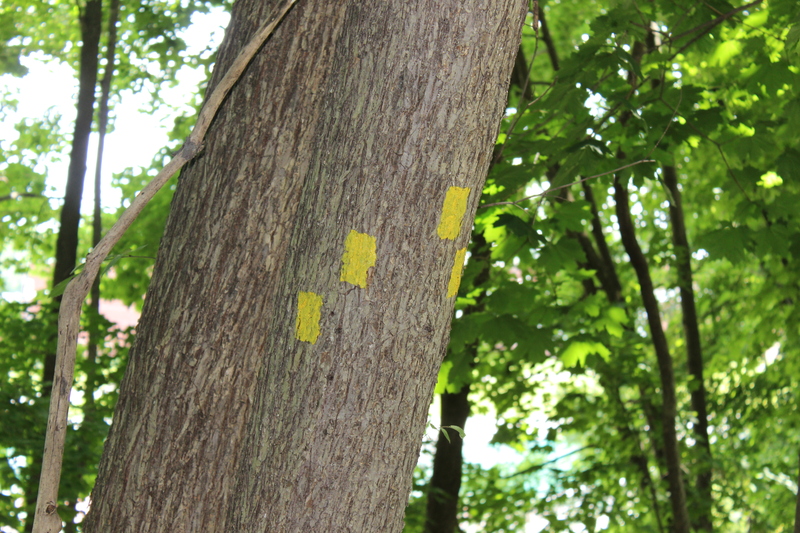 You can tell when you’re on the Lenape Trail when you see the yellow blazes on the trees and telephone poles. Yellow blazes for the Lenape Trail. 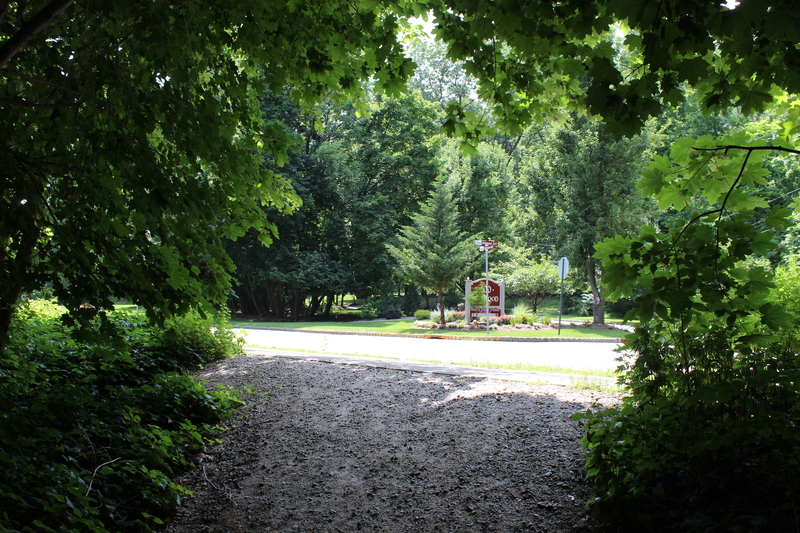 The trailhead, as I mentioned, is a large opening in the woods on Fairview, a short distance to the north of Verona High School. Some people have trouble finding the trailhead here – I had to search for a few minutes myself. So, my advice to you: Look for the T-intersection with Hillwood Terrace – the trailhead is right across Fairview from Hillwood. The trail technically starts a little farther down the street. There is a trailhead – marked with a Green Acres (one of New Jersey’s open space programs) sign – at the end of Arnold Way, a side street just south of the school. From there the trail goes through the woods until it re-emerges at a set of concrete steps going back down to Fairview Avenue. From there you cross the street and head up to join the rest of the trail. But it seems that a lot of hikers and bikers just head straight for Fairview. Parking: I’d parked my car just down the street from the school (you stand your best chance of getting a parking spot on the weekend during the summer) and walked north from there. Farther up the trail, in Cedar Grove, there are a couple of small parking areas, including one on Slattery Way. In Verona, the trail takes you around the back of a lot of people’s backyards. With some, you can see where the residents have their own little footpaths leading up to the trail. There’s one spot on the trail where a park bench has been set up, with a few shrubs and flowers. There are a few spots where the trail crosses an active street: Durrell Street in Verona and Keeney Street in Cedar Grove. There has been some construction on a new housing development at Durrell, so hikers, please look both ways for traffic. And drivers, please keep your eyes open for hikers. Flora and fauna: The wineberries – a close relative of the raspberry – are in full season in July, and there’s a bunch of them along the trail. They’re technically considered an invasive species in a lot of places – but they’re tasty. Most hikers I know (myself included) can’t resist snacking on a few as they go along. Traipsing around in the undergrowth off the trail is not a good idea – the poison ivy is also in full season. Spotted lots of robins, a bunch of squirrels and the occasional chipmunk. And a blue jay feather. Once you’re in Cedar Grove, the trail takes you past the former Essex County Hospital Center, once known as the Overbrook mental hospital – now counted among New Jersey’s cool-but-weird landmarks. The place has quite a history, one which would take more than a few blog postings to explain. There are chain-link fences and video surveillance to keep unwanted visitors out of the hospital property. The hospital has not been in active use since the 1970s; the new hospital, which opened in 2006, is just to the southeast on Grove Avenue. You’ll eventually come to a footbridge crossing over NJ Rt. 23, locally known as Pompton Avenue. Down below, you’ll see Myrtle Avenue – with the Cedar Grove Ambulance and Rescue Squad headquarters nearby – on one side, and Grove Avenue on the other. If you’re thinking of joining the trail from that intersection, there is a set of stairs leading from the street up to the footbridge. And if you need to step off the trail and go get some snacks, there are some stores just up from Grove. The Peckman River bridge in Cedar Grove. 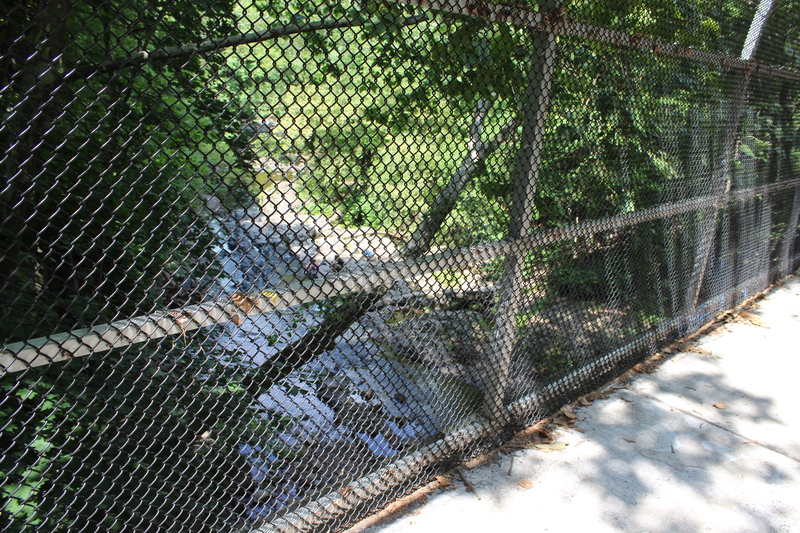 The trail then proceeds to the next major landmark, the bridge over the Peckman River, a tributary of the Passaic. The land around this part of the river is part of the Cedar Grove Community Park. At the northern end of the bridge, there is a side path where a lot of walkers like to climb down and check out the river – and a few families with kids were down there when I came by. Watch your footing on the path, though – use your hands to grab onto the trees, or even ease yourself down in a sitting position. This is a nice scenic stop; there’s a few waterfalls and pools at this section – mind your footing on the rocks, of course. At this point, I had to head back whence I came. But I promise you that I will do a subsequent posting about the remainder of the trail. “Sure, it’s right there,” I say, pointing back toward the trailhead. If you’re already in Essex County, take Bloomfield Avenue to Fairview Avenue and head north. If coming from elsewhere in New Jersey or beyond, take I-280 to Pleasant Valley Way in West Orange. Head north on the street and that will take you to Verona and Bloomfield Avenue. Weird NJ has done quite a number of excellent articles and blog postings on the old Overbrook hospital. Check out some of the articles here.